To make Snow 21 Set a quart of new milk over the fire, sweeten it, and add to it some orange flower water. 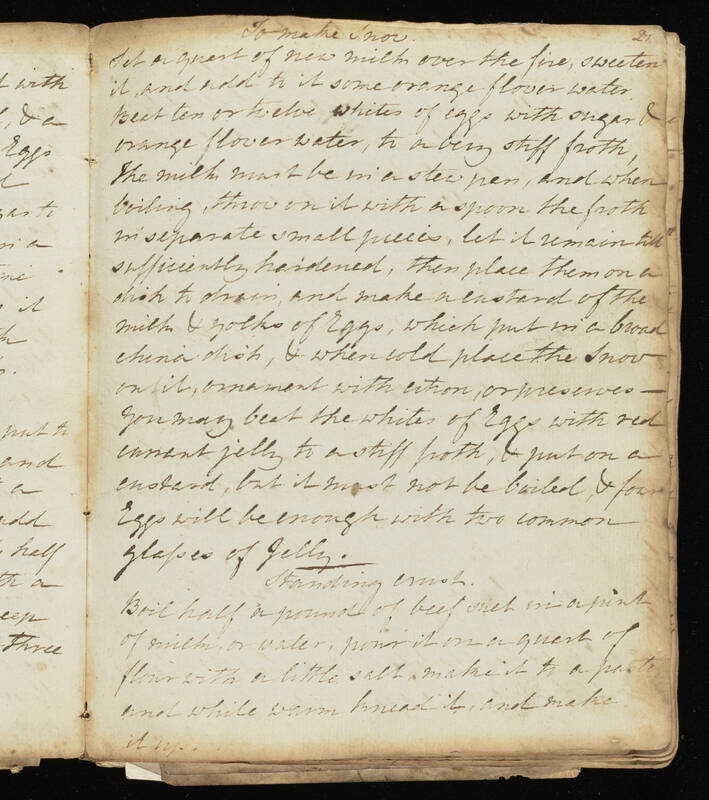 Beat ten or twelve whites of eggs with sugar & orange flower water, to a very stiff froth, The milk must be in a stew pan, and when boiling, throw on it with a spoon the froth in separate small pieces, let it remain untill sufficiently hardened, then place them on a dish to drain, and make a custard of the milk & yolks of Eggs, which put in a broad china dish, & when cold place the Snow on it, ornament with citron, or preserves - You may beat the whites of Eggs with red currant jelly to a stiff froth, & put on a custard, but it must not be boiling, & four Eggs will be enough with two common glasses of Jelly. Standing [Crush?] Boil half a pound of beef suet in a pint of milk, or water, pour it on a quart of flour with a little salt make it to a paste and while warm knead it, and make it up.